(12/09/2015) On the 12th Sept. 2015 MedLab Translatis organization arranged workshops for teachers of English on EMP. There is still a gap in such events in Poland where professional knowledge on English for Medical Purposes can be shared. Participating teachers were either professionals in the field who were giving lectures on Introduction to Medical English, Medical English – anatomy and physiology, Pharmaceutical English, English for Dentistry, English for Physiotherapists and English for Veterinarians. The second group of teachers consisted on English lecturers who feel the need of developing their ESP (English for Specific Purposes) skills. 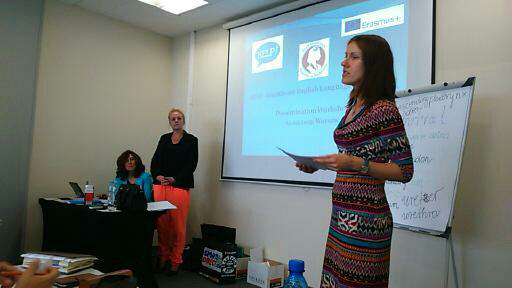 The workshops posed a wonderful opportunity to present the HELP project to wider audience. Stowarzyszenie Angielski w Medycynie’s performance was included in the agenda of the overall meeting. There have been crucial information about the project presented: scope of work, objectives, aims, final products, target users, milestones and state-of-the-art. The project’s idea evoked great interest in the target audience, both in the teachers who teach EMP and in the ones who need self-study in this area of specialization. Oral feedback during workshops was most frequent.